This project was actually started for a club build that didn’t get finished in time. I can’t say how many hours I have into it, but it was started almost a year ago and I’ve been working on it non-stop for about 4 months. Additional modifications: Reduced front wheel wells, increased front window. Filled rear deck with recess for tow rig. Engine cover from TD Vette kit. 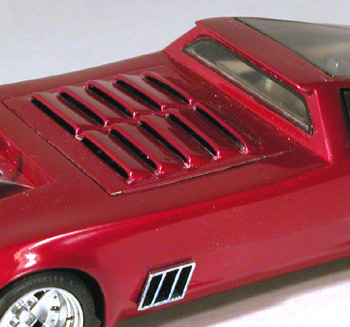 Rear vents added to both sides – one for a scratchbuilt exhaust vent and one for the rear end cooler inlet. A chin spoiler was also added. The paint is Testors candy apple red over a silver base. Completely scratchbuilt front and rear grills were treated to a little Alclad and then given hand fitted lenses. The belly pan was covered by carbon fiber decals and Dzus fasteners. 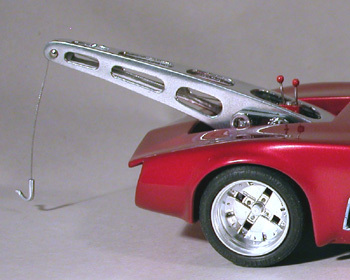 Tow Rig: The rig frame was scratch built from styrene and treated with Alclad. It houses aluminum rollers and a drive motor fashioned from a P/S oil tank. The jewelry wire cable spool would be driven from the motor by the dual belt drives made from shortened blower belt assemblies. 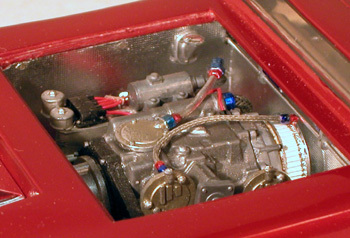 Engine: Revell parts pack turbine with fuel line, ignition, and bolt detail added. Multiple shades of metalizer were used for visual interest. The engine compartment is lined with scratch build panels that feature heat shielding made from cigarette liners. These also have Dzus fasteners added. Hanging from the back of the torque reducer on a scratch built bracket are the alternator and AC units from a Monogram 32 Ford. There was no provision for them on the turbine engine. Also from the 32 Ford is the air cleaner mounted at the front of the engine. Chassis: Heavily modified Banshee chassis frame with reduced height in front and scratch built rear and engine cradle sections. 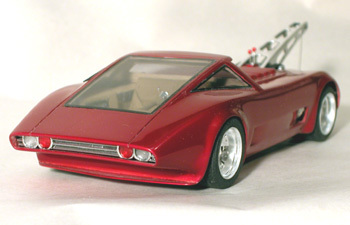 The chassis is painted Tamyia red. The basic rear-end is a combination of a Monogram 12 bolt with and Entex trans-axel added to the back. This assembly was dressed up with cooling line and a gear driven shift mechanism made from watch parts. The rear suspension is Monogram P/S four link backed up by air bags for increased towing loads. Interior: The basic tub was scratch build from styrene. Cuts were made to recess some gauges and a stereo. Then was primed holding the piece as far away as possible to create a textured surface with was then covered in a light tan. Photo etched speaker grills and Deora air conditioning vents were added. 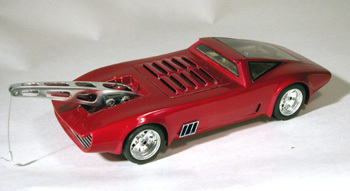 The Aerovette seat was narrowed, painted Testors leather and shined up with a little nose grease. Seat belt detail was also added. Finally, a swing away steering wheel was make from an inverted Ice T’ wheel. It feature thumb shifters and a center mounted tach. As custom license plate brings up the rear.